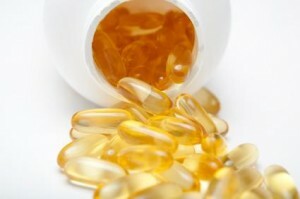 Vitamin E contains two major fractions with each containing 4 major parts designated as Tocopherols and Tocotrienols and each has an alpha, beta, gamma, and delta component. 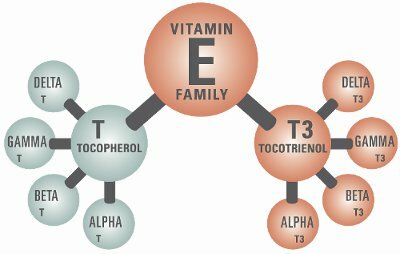 More recent research shows that TOCOTRIENOLS may be the most important members of the Vitamin E family. Tocotrienols have been shown to extend life span by almost 20% and are clearly 40-60 times more effective as an anti-oxidant. They are very protective of our cardiovascular system reducing atherosclerosis and even reversing obstruction of the carotid arteries thus reducing risk of strokes. The tocotrienols can also affect cancer by inducing programmed cell death called APOPTOSIS and inhibiting cell proliferation. One other major property is its ability to down regulate vascular endothelial growth factor, or VEGF, which controls the growth of blood vessels. In previous E-alerts, I explained the frequent presence of multiple cancers in our body but they cannot grow larger than the tip of a ball point pen unless they have an infrastructure of blood vessels to feed it. Tocotrienols, the DELTA and GAMMA isomers, are especially powerful in all three mechanisms for preventing and treating cancer. Most physicians know that it is very difficult to treat a malignancy once it grows to a certain size. A primary tumor can shed into the blood stream as many as four million cancer cells a day. It is only your body’s ability to kill them through a healthy immune system and through induction of apoptosis and anti-proliferation that we do not get clinical cancer. The discovery that TOCOTRIENOLS can control all three mechanisms in preventing and treating cancer, as well as protecting our cardiovascular system is the message of this ALERT. I strongly encourage all of you to add Delta and Gamma Tocotrienols to your daily nutritional regimen. 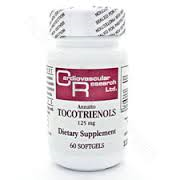 Clinical studies show that a 78mg dose of tocotrienols can raise the plasma level to 8.17 mcg/L; an 8 fold increase over the normal un-supplemented 1mcg/L blood level. This will inhibit proliferation of a cancer cell by 50% but you need about 24mcg/L to induce apoptosis or natural cell death. The body can naturally concentrate tocotrienols into breast adipose tissue 5 to 10 times the plasma levels. This suggests that the preferred dose of tocotrienol, to accomplish all of the above, is about 240mg daily or 2 caps a day. The Center has a very reasonably priced product distributed by Cardiovascular Research. Each bottle has #60, 125mg capsules or a month’s supply for $30.